India fell short of their target of 364 from 98 overs despite captain Virat Kohli's 141 and Murali Vijay's 99. Vijay fell in the 10th over after tea, lbw to Lyon one short of his century, and India's hopes further dimmed when having completed his second century of the match, Kohli was caught on the mid-wicket boundary by Mitchell Marsh off the bowling of Lyon. Ishant Sharma was last out, stumped by stand-in captain Brad Haddin off Lyon, as Australia - wearing black armbands to honour their late team-mate Phillip Hughes, who died on 27 November, two days after being struck on the head by a ball during a Sheffield Shield game - wrapped up the win to take a 1-0 lead in the series. "I don't really want to talk too much about that, to be honest, because I'll get too emotional. He's in our minds, he always will be, and he will be for the rest of my life." "It's Test match cricket, and there are always little turns and stories in the game. but we knew that if we stayed patient long enough, things would turn around," he said. "I told the guys last night that we had to come out tomorrow and chase it. I believed throughout in my own ability and the ability of the guys," he said. "But the whole Australia team put up a great fight - credit to Nathan Lyon for a great spell where he bowled the balls in the right areas." "I think winning games of cricket are based on skill not emotion, but when you get the result you're after I think that's probably when you see the emotions come out," he said. "Hence the celebrations after we took that last wicket - the boys are pretty emotional in the changing room now." The players also sang their traditional victory anthem Under the Southern Cross on the pitch of the Adelaide Oval after the match. The song, popularised by former Australia wicketkeeper Rod Marsh, is usually delivered in the dressing room. 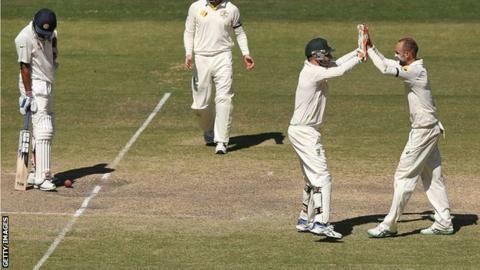 Read more on Michael Clarke: Injured Australia captain may "never play again"